Alyson’s Orchard’s is the perfect place to bring your group to enjoy a guided tractor ride around the orchard. 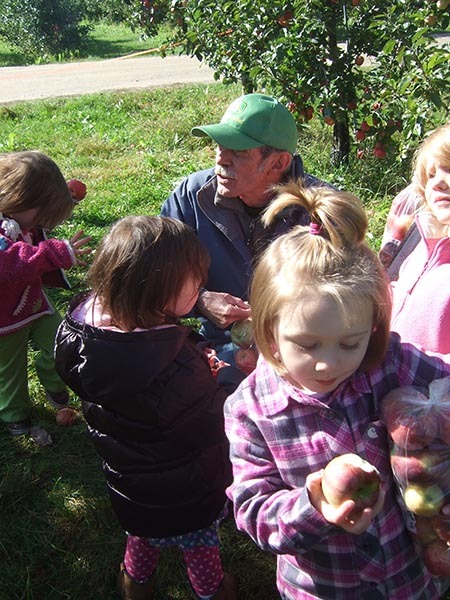 One of our farmers will lead your group with age appropriate narration and activities designed to give you a feel for life at the orchard. You will learn all about a working orchard as well as the different crops we grow. The tour will not only be educational but fun for everyone. Alyson’s Orchard has public restroom and portable toilets on the premises for our visitors. Please note that tours do go out rain or shine, except in severe weather conditions. We have a covered wagon. Wagons cannot accommodate strollers or wheelchairs. Please have children dress appropriately for the weather (boots, raincoats, hats, jackets, mittens, etc). We also recommend that everyone wear closed-toe shoes. Alyson’s Orchard reserves the right to cancel any tour due to severe weather conditions. Should cancellation by the Orchard be necessary, we will notify your tour’s contact person by approximately 8AM on the day of the tour. In this situation, we will try to reschedule the tour.